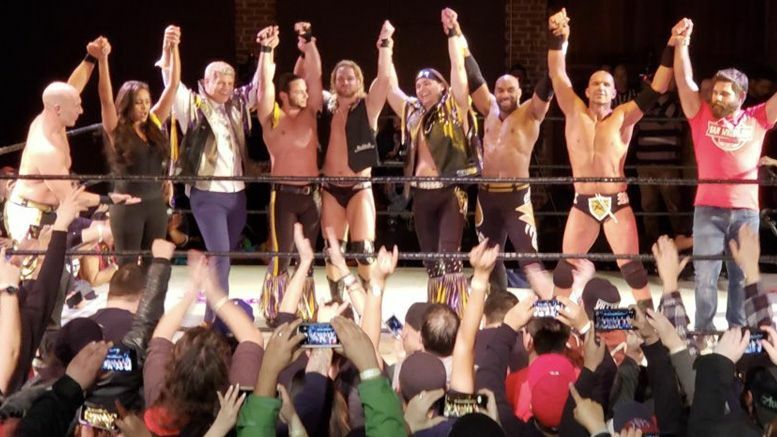 Members of The Elite made a surprise appearance at Bar Wrestling in Los Angeles on Wednesday night and we’ve got some of the footage of what went down. It all happened at the Bootleg Theater during the main event after SCU laid out an open challenge which was answered by RockNES Monsters and Watts. Both referees got knocked out at one point in the match and Joey Ryan intervened to stop Watts from hitting Scorpio Sky with a chair. Joey got attacked for doing so and Hangman Page came out to save him. The two rivals then put their differences aside … by making Watts grab their penises. RockNES Monsters returned to the ring afterward and attacked Joey/Page from behind, but Cody and Brandi Rhodes came out to make the save. Brandi hit the Bionic Spear and Cody hit an outside dive while wearing his dress clothes. Watts re-emerged and hit Cody with a big boot … then The Young Bucks hit the ring. The full match showing SCU end things with a victory will be available soon on Pivot Share. According to SoCalUncensored.com (where the group’s name came from), Cody told the crowd during a post-match speech that they were all signed to AEW … then Brandi made him fire them. This appearance is the first for the group after announcing their new promotion All Elite Wrestling.